Some politicians only bother to undertake good deeds when they can bring their campaign reporters and photographers. Others are more decent and less craven. In July 2007, Gov. Sarah Palin (R-AK) traveled to a U.S. military base in Kuwait to visit Alaska National Guard soldiers who provide logistical support for our operations in Iraq. On her return trip, she stopped to visit wounded troops at Landstuhl Regional Medical Center in Germany. Although most of the many photos I've re-published of Gov. Palin have come either from press sources or the Alaska gubernatorial state website, the particular photograph I re-published of her at Army Private James Pattison's bedside (which I include again below) was taken by an official U.S. military photographer (Airman 1st Class Kenny Holston) and published on the internet on the website of the Alaska Department of Military & Veterans Affairs. As far as I know, although Gov. Palin helped lead her high school basketball team to the state championship, she did not attempt a three-point basketball shot on her trip to the Middle East and Germany. Nor did she presume to solicit support from the citizens of Berlin. Above, Gov. 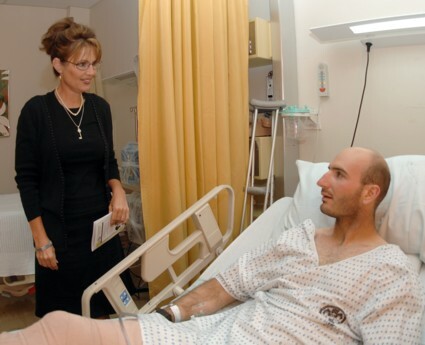 Palin visits with Army Sgt. Maj. Clifford Docktler. Above, Gov. 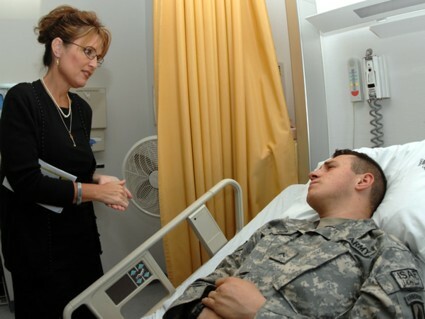 Palin visits Army Pfc. John Kegley. Sarah Palin the current Governor of Alaska is John McCain’s ultimate choice for VP. I do believe a woman is next in line for the presidency. All Conservatives like her. She is popular in Alaska. Hillary supporters would relish her. She would solidify a 12 or possibly 16 year Republican executive. John McCain’s boring campaign is wearing thin. I need a little Palin Power to get me interested again. They would say ‘but she is only a half term Governor!’ And your point is? Thank you for your lovely post and photos. I love your blog. I do like Sarah Palin and I think she would certainly reign in the Hillary votes. I also still love my man, Mitt. What to do, what to do? Gov Palin would be a very exciting choice for Maverick. A great move. That first photo is unusual---the soldier is lying in bed wearing his fatigues. Maybe he's just receiving some type of out patient service. PC14, I'd say he knew he was going to get a visit from a Governor and "dressed up" for the occasion. Vote for the Grumpy Old Man. tmac, thanks for the catch. I've duly corrected my original typo ("R-AL") in the text of this post. In politics, it's always helpful to be adorable, and Gov. Palin sure rings the bell. Beldar, I know you must be familiar with the Powerline Blog. I took the liberty of linking this page in a discussion called John Kasich for Veep. Sarah Palin has become an integral part of that discussion. Perhaps you would like to bop in and add something. You do a great job here.